So, you spent a handsome sum on the best pup money could buy. He’s got the fancy name, a pedigree with more red ink than you’ve ever seen. And you did everything right. He’s had the best food, the best care. No endless retrieves, no silly games with the kids. 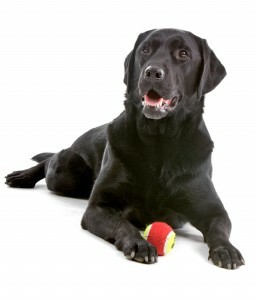 You kept his retrieving ball special, but your dog won’t even pick it up. Not once has he ever put the damn ball in his mouth. And before I ask, yes, you have tried other things, toys, socks, puppy dummies, you name it. He runs after anything you throw, and then runs right back again, WITHOUT it! Your friend brought a labradocker from a guy in the pub, feeds it scraps and calls it Dave. Dave retrieves. He is onto casting and lining now. He does water retrieves too and has picked up cold game. Dave is the real deal. Whilst your handsome aristocrat is just, well, embarrassing. It isn’t fair! What is going on? Ok, breath deeply and relax. Firstly, this is not a disaster. It doesn’t mean you’ve wasted your hard earned cash on a heap of rubbish. It doesn’t mean you have ruined your puppy. One of the best retrievers I have ever owned was a cocker that didn’t pick up a thing until she was eight months old. She’d run after it alright, but nothing, absolutely nothing, would induce her to put it in her mouth. She’s nearly twelve now and still puts most Labradors to shame. Here’s the thing. Sometimes this kind of reluctance is someone’s fault. But sometimes it isn’t. These things happen, and sometimes we just don’t know why. There is no need to analyse them. The fact is, nowadays we have a much better tool to resolve this little problem than I did when my cocker was playing up, eleven years ago. I had to just wait patiently, and keep trying every few days, until eventually she picked up a dirty old balled up sock that I had rolled down my hallway. And that was my way in. You however, don’t have to wait if you don’t want to. You can teach your dog to pick up anything you like, using the clicker retrieve. For a long time the gundog community resisted the clicker retrieve. For several reasons. Not least because clicker training has been widely regarded with derision by people with ‘real working dogs’. And especially because it involves food. And we all know what happens if you rewards dogs with food for retrieving don’t we? Timing is important no matter what kind of reinforcement you use to encourage your dog to repeat good behaviours. If you always waited for your dog to spit out his dummy or ball before rewarding him with some fuss and praise, he’d soon have a spitting habit wouldn’t he. This would be the case even though you weren’t using food. In fact some novice handlers do make this mistake and end up with a spitter, and not a morsel of food in sight. We are careful to reinforce the dog for holding his ball. Praising and stroking him as he holds it in his mouth. It’s all about timing. Bad timing causes spitting. And it’s the same with the food reward. Before you roll your eyes, we have a clever solution to that problem. We use what is called an Event Marker, a signal, as a temporary substitute for the food reward. The most effective event marker is the clicker. The click lets the dog know exactly what the food is for. So even though he has to spit the dummy out to eat the food, we can still reinforce the ‘holding’ behaviour that preceded the spit. We first build an association in the dog’s mind between the click and the reward we give the dog afterwards, and this does not take long. The click itself then takes on the power of the food reward in the sense that it makes the dog feel good. Just like the petting and fussing you used before. A clicker can be used to create brand new behaviours. Behaviours that did not exist before. Like picking up a ball in a dog that has never picked up a ball in the past. This is achieved by a process called ‘shaping’, where we reward increasingly close approximations to the behaviour that we want. With the clicker retrieve that means we might first teach the dog to simply look at the ball. That’s pretty easy isn’t it? We just put the ball on the floor and click the dog for glancing at it. You might need to roll it a little to get his attention to begin with. As long as we always follow each glance with a click, and each click with a treat, he’ll soon figure out that all he has to do is glance at the ball and hey presto, it’s party time. And then we are a little bit mean. We stop clicking and treating the dog for looking at the ball, and we wait. And wait. The dog will look at the ball, and then back at you expectantly? And still you wait him out. What’s going on here?” he’ll be thinking. He’ll be feeling a bit frustrated now. “Are you BLIND or something?” He’ll think. “I am LOOKING at your stupid ball!” And he’ll take a step towards it to emphasise the point. At which point, you ‘click and treat. From now on, you ONLY click and treat when he steps towards the ball. You can see where this is going. Every time the dog gets to grips with what we want, we make it just a little bit harder. Soon we’ll be asking him to touch the ball, and eventually to pick it up. This process is actually a lot easier to control with a dummy rather than a ball, but essentially you can clicker train a dog to pick up anything he is capable of fitting in his mouth. And you can find the instructions for doing so right here. The Clicker Retrieve. Plenty of gundogs are now clicker trained. We even have clicker trained FTCHs. It’s fun – so why not go and try it? And come back and tell me how you got on. Just read your article after seeing the fantastic gundog display using clickers at crufts and being recommended to take a look around here! We have always always been told not to use a clicker with our golden retriever but after seeing the potential that clicker training/ clicker retrieve has I am excited to get started! Ready to get my beautifully bright boy onto a new way of training and begin his gundog journey! Brilliant article and so well written.